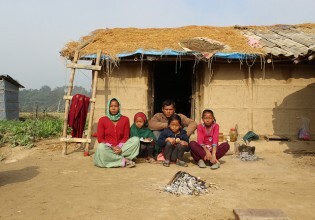 When 26-year-old Laxmi married into the Archaya household in Chhaimale village, Pharping, south of Nepal’s capital Kathmandu, she didn’t think she would be spending half the day in the kitchen inhaling smoke from the stove. Every morning, Raj Kumari Chaudhari walks from her home to the other end of Padnaha village, located in the Bardiya district of mid-west Nepal, to a big mango tree to offer prayers. Durga Ghimire had her first child at the age of 18 and the second at 21. As a young mother, Durga didn’t really understand the importance of taking care of her own health during pregnancy. Water is a critical resource in Nepal’s economic development as agriculture, industry, household use and even power generation depends on it. The good news is that the Himalayan nation has plenty of water. The bad news - water abundance is seasonal, related to the monsoon months from June to September. Around 4.3 million of Nepal’s 27 million population lack citizenship documents, rendering them stateless, says a report by the Forum for Women, Law and Development (FWLD), which works to promote and protect the interests of Nepali women. Last December, Pradeep Dongol, child protection officer at the Kathmandu-based Children and Women in Social Service and Human Rights (CWISH), received an urgent call from one of the NGO’s many offices in Nepal’s sprawling capital city. Bhagwati Adhikari was a teenager when she was married off to a village boy of the same caste. Just a few years later when she was in her early 20s, she became a widow. Her husband, who worked as a security guard in Kathmandu, was murdered. Adhikari was left alone to support her family.